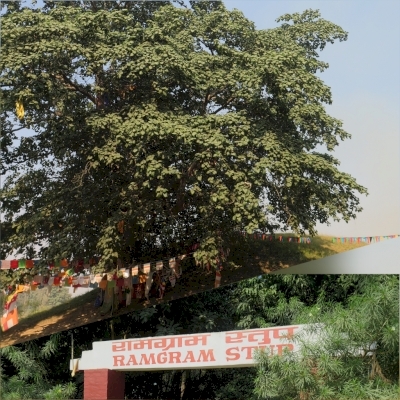 Ramagrama, the relic stupa of Lord Buddha is part of the Tentative list of Nepal in order to qualify for inclusion in the World Heritage List. The documentation for this must be the shortest one in existence: "The only undisturbed original stupa containing relics of Lord Buddha. Built in 6th century B.C. and enlarged by being enveloped with bricks subsequently. The site includes adjacent monasteries." If not on the way from Lumbini to Chitwan I would be a bit pissed for the few minutes it wasted. Well, with the drive off the main road to the stupa area I suppose that's 20min wasted. For a non-religious person you will see a tree growing on a hill. Basically that IS the stupa. The stupid is underneath, now overgrown, "undisturbed" as the documentation says, and you don't see anything else. It had a lot of followers praying so I don't want to dis the place, just that I don't consider it world heritage material based solely on religious believe and relics as wikipedia would put it "according to Buddhist tradition", i.e. not facts. Maybe the "Science" in UNESCO doesn't apply sometimes seeing that a few sites are already on list based on mythology. A lot of places around seem to claim relics of Buddha are inside and I have a hard time believing it.